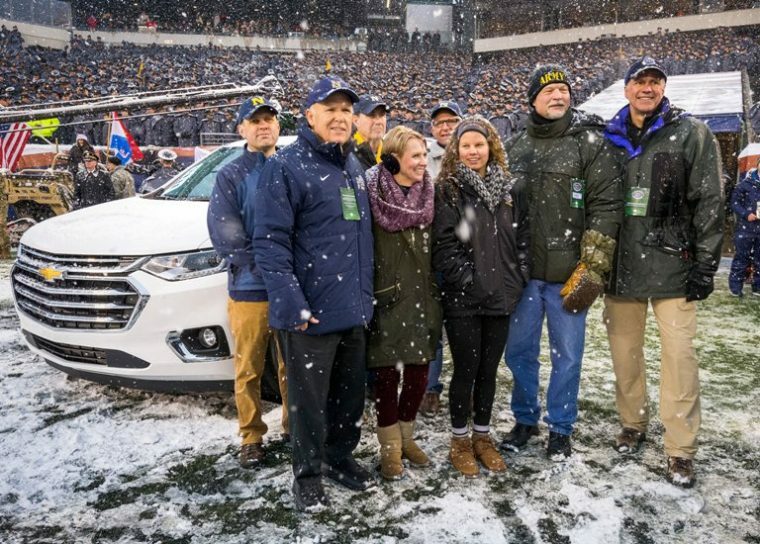 This past weekend, Chevrolet served as the official vehicle of the Army-Navy Game for the eighth year in a row. That partnership extended far beyond merely sponsoring a game, however, as Chevrolet presented a 2018 Chevrolet Traverse to Shawn Moore, a volunteer for Operation Homefront. Moore serves as the group facilitator for Operation Homefront’s Hearts of Valor program. Hearts of Valor assists ill or injured veterans and works to create a supportive community for them. The Hearts of Valor program is a cause that is very near and dear to Moore’s heart. Her husband, Bryan, served during seven tours and 23 years of service in the United States Army before he retired for medical reasons. Presenting the Traverse to the Moore family was Dan Akerson, the former chairman and CEO of General Motors. This event was something of a homecoming for Akerson, as he is a U.S. Naval Academy graduate. Founded in 2002, Operation Homefront is a national nonprofit organization which oversees several programs like Hearts of Valor. Its mission across the board is to build strong and stable military families. The Army-Navy Game sponsorship and partnership with Operation Homefront are just a few ways Chevy recognizes those who serve or have served in the United States Military.